by resting the mouse over each section as you read the story. The little girl has climbed up on the lounge and is teasing the kitten with the bird. 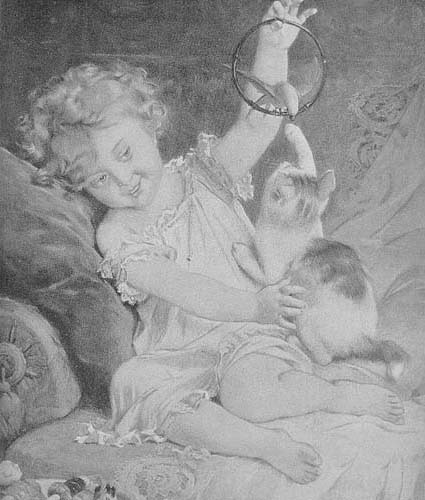 She holds the hoop with the parrot just out of reach of the kitten's paw. The kitten is very interested in the bird and the parrot is attempting to defend itself. Does the child realize the danger to which she is subjecting her small pet? Imagine the tears if the feline follows through with her natural instincts. Look at the enlarged version. Observe the abandoned toys at the bottom of the picture.